There are few interior designers who don’t agree on one point in house decoration: the bathroom, no matter how big or small, is the most intimate place in the house and thus deserves our most careful attention. It is true that we spend more time in our living rooms, need to find comfort after a work day’s length in our bedroom, need to feel inspired and relaxed in our kitchens whenever we display our culinary talents, but it is no less true that we also need to feel great and comforted in our bathrooms too. Decorating ideas for bathrooms or for small apartments always kept the interior designers in a constant challenge of finding the best solutions given the limited space, but some of them have come with ingenious options to make even the smaller bathrooms compete in style and grace with sumptuous and luxurious celebrities’ bathrooms in their lavish apartments or homes. Now it’s time to take a look over some simple, cheap and creative ways of turning small bathrooms into real works of art with the help from some home interior designers and specialists who are always willing to give us a hand in finding our own personal style and views. Reserve a 10-20% extra for unexpected costs. We came across countless ideas when searching for small bathroom decorating ideas, but the barn style was more prevalent than any other. We can understand the appeal of having a rustic interior firstly because it creates a feeling of warm and welcoming bathroom oasis. 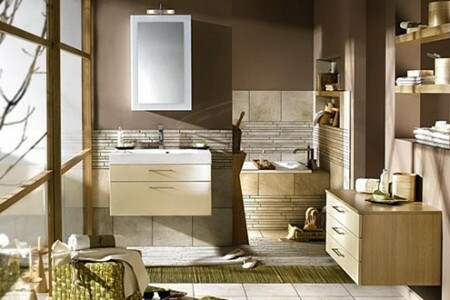 It is of vital importance to create a calm and relaxing space in your bathroom, because it is basically the only place where you can actually disconnect from the mundane problems of everyday life. The best part about it is that you can re-purpose vintage objects and industrial elements and handle the project yourself. In other words, it is very cost-effective. 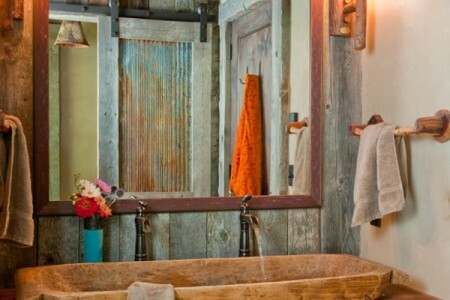 In addition to this, barn style small bathroom ideas can be easily customized for the needs of your apartment. There are several different styles to decorate your bathroom in, but barn interiors seem to be a popular and current trend. For example, you can mix industrial elements with wood to preserve the feeling of modern and inviting, or you could add some folk art on the walls and brown rugs for a rustic look. 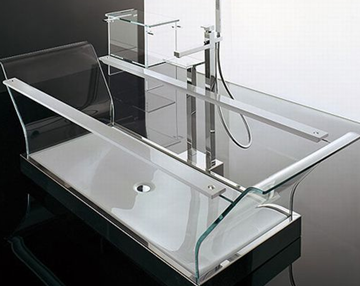 This self-sufficient, homegrown appeal will definitely bring the wow effect to your bathroom. 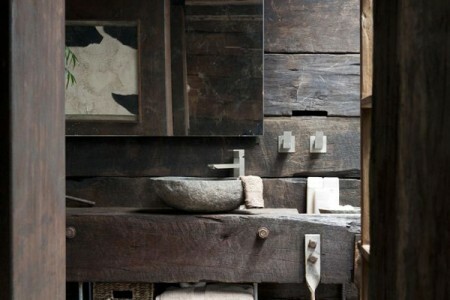 We headed to OneKindDesign to check out 51 insanely beautiful rustic barn bathroom decorating ideas and we were pleasantly surprised. Is is incredible what the people over there could do with their bathrooms, especially on tight budgets. 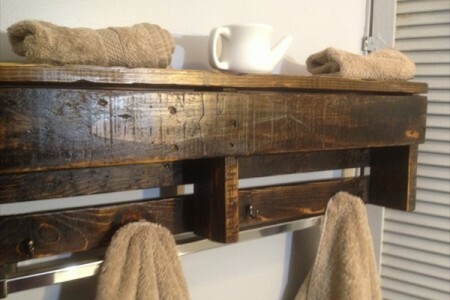 This is the perfect DIY / tight budget project which fits in the basic bathroom remodel category. It shouldn’t cost more than 3.000-12.000$. Costs may very if you decide to do it yourself. Even if you can’t change the plumbing, or replace fixtures your remodel should include new counter-tops, tiles, walls, cabinets, lighting fixtures & finishes. You can cut down on the costs by visiting a flea market or yard sale. Re-purposed furniture looks excellent in this type of decor. 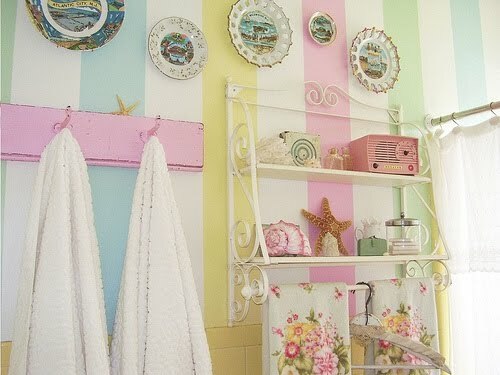 Small bathroom decorating ideas can’t get more creative than this! 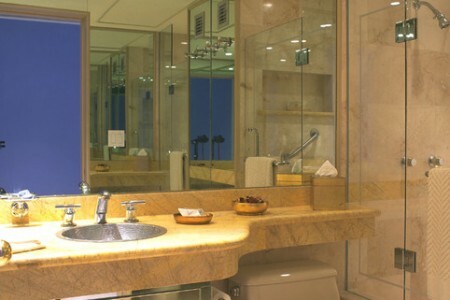 Number two on our small bathroom decorating ideas list is the fake mirror windows decoration. Small apartments and studios don’t usually relish on large windows and there is a high probability that a small studio bathroom is built with windows of its own. However, if you have enough storage space and a bit of a wall still open to being decorated, frame a mirror so it gives the impression it is a real window. This way you will make the space look suddenly wider and if you choose the proper lighting you will feel like inside a miniature model of a celebrity’s tennis – court sized bathroom. Fake mirror windows are a huge trend in home design, and if you take a look over at Houzz, you will find there around 218,559 photos proving that not only the bathroom can benefit from this ingenious idea, but also other small rooms in the house, such bedrooms and even children’s rooms or leisure rooms. 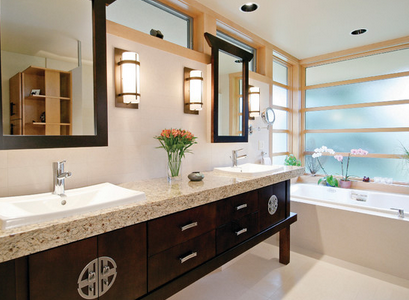 Small bathroom decorating ideas don’t necessarily have to mean an entire remodel. You can simply add a quick and cheap fix to lighten up your space. 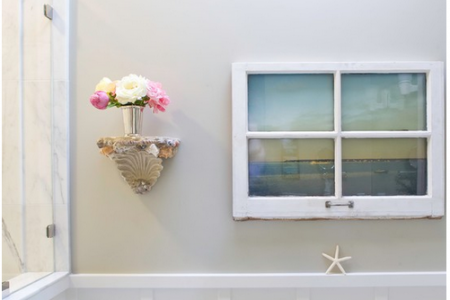 Adding fake mirror windows might be just what you need to refresh your space. As far as price goes, there are many possibilities. 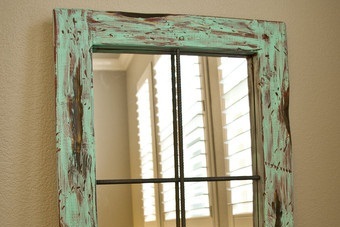 If you choose to purchase an old window frame, add a mirror, and re-paint it yourself chances are that it will not be more than 300$. 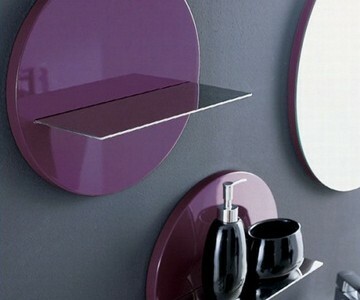 On the other hand, if you want to add a wall-sized mirror it can even reach 2000$. 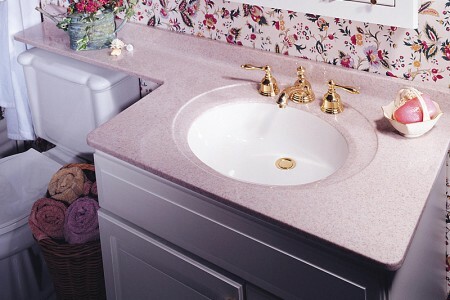 A pink counter-top which hides the toilet. 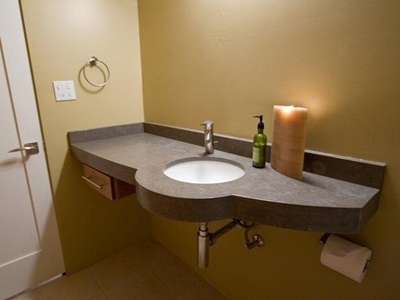 This extended counter-top holds the sink and the toilet. 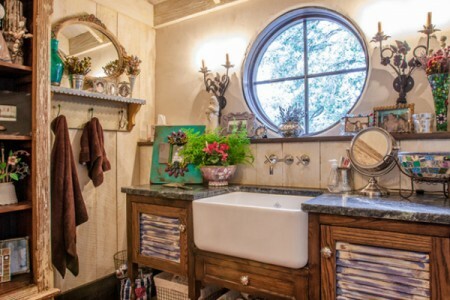 Precious counter-tops are durable and work perfectly with vintage bathrooms. 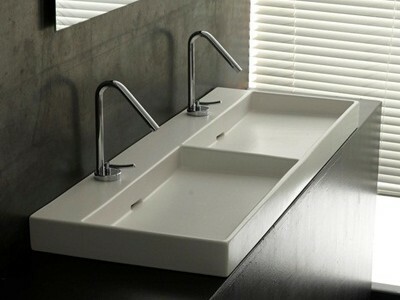 This idea belongs to designer Andreas Charalambous and it is not about using large bathroom decorating ideas and solutions, but actually saving some space by giving the sink the counter – top it deserves and extend it in the shape of a narrower shelf across the wall, if permitted. It may seem that you abuse the little space you have, but in fact this ledge can hold mini baskets or boxes, perfect to keep your bath accessories in one place. If your interior decorator is indeed talented, he or she will manage to give you the best solutions in order to use the ledge in more creative ways. 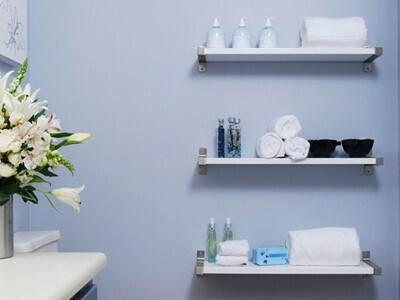 Some people brought in small flower pots for a more exotic and elegant feel to the bathroom, while others arranged their bottles and their tubes, boxes and colored toiletries in such a manner that the entire bathroom looked like a spa or a cosmetic parlor. If the extended counter top is white, colored bottles can only make the bathroom look more jolly and interesting, whereas if you are in for pastel walls or colored furniture, some green leaves may be everything you wished for. Modern finishes work sublimely with rough-industrial bricks. Massive counter-top unifies the appliances in the bathroom. 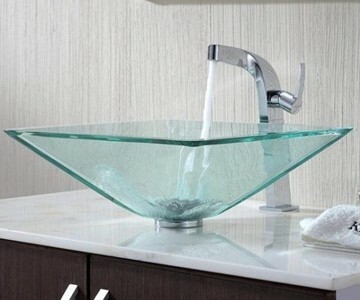 You will basically be paying the price of the counter-tops and eventually new faucets and cabinets. Prices for counter-tops vary depending on the material. For example, marble counter-tops are approximately 125-250$/sqf, granite counter-tops hover between 125-225$/sqf, engineered quartz prices are between 100-185$, concrete counters cost approx. 70-140$/sqf . Cost for other counter-top materials: 75-120$/sqf solid surface counters, 50-125$/sqf recycled glass countertops, 35-200$/sqf wood & butcher blocks, 20-75$/sqf tile counters and 20-50$/sqf laminate counters. 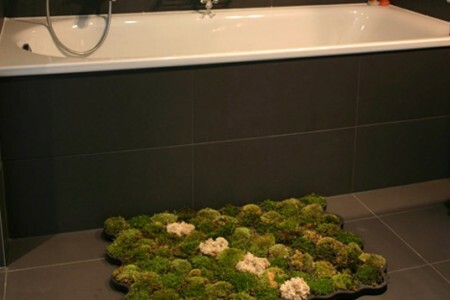 Modern bathroom combined with real nature, a carpet that exists out of REAL moss. This interior designer trick is used mostly for small living rooms or bedrooms, when a carpet, usually of a contrasting color than the walls and the floor visually marks a space and enhances it. 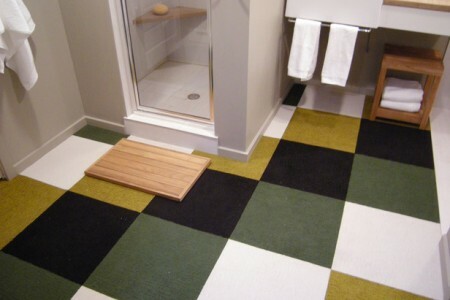 Using a real carpet to define the space in your bathroom instead of the regular wet mat may produce the illusion of space within space. 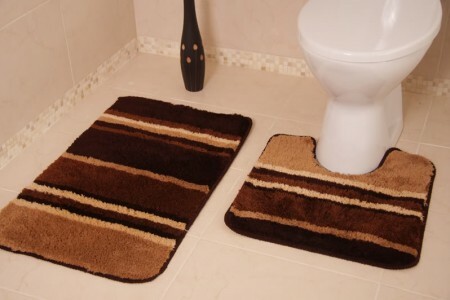 It is true that carpets work best for large bathrooms, but even smaller ones can benefit of their magic if used properly. Some more ingenious designers use the same carpet model and even patches of textile to decorate the walls and obtain a symmetry effect that can only lead to a beautiful design. If you want to learn more about the tips and the tricks to use rugs to create the impression of space, this article for Apartment Therapy might just come in handy. Or you can play with patterns and textures. Brown stripes against a pale background. Exactly the price of the carpets that you are going to purchase. That basically means it’s super cheap. You can never go wrong with neutral. 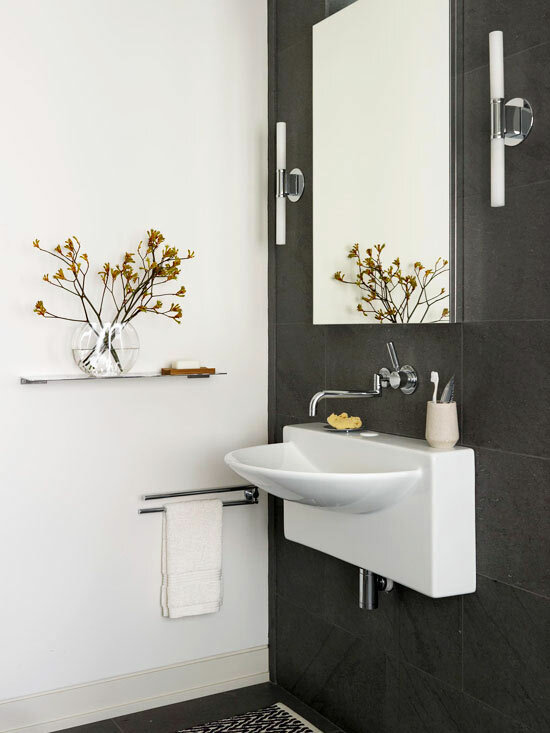 There are some terrific bathroom decorating ideas that come from FreshHome, but this one really is worth the attention, especially if you happen to own a very narrow bathroom with a shower implanted in the wall and enough space to take some steps around. Sometime ago we took a look around in the search for some creative ideas to liven up our walls, but applying the same concepts to small bathrooms seems to be the next best thing in interior design for studios and small apartments. This picture shows a black combo, but you can play with colors as much as you want. 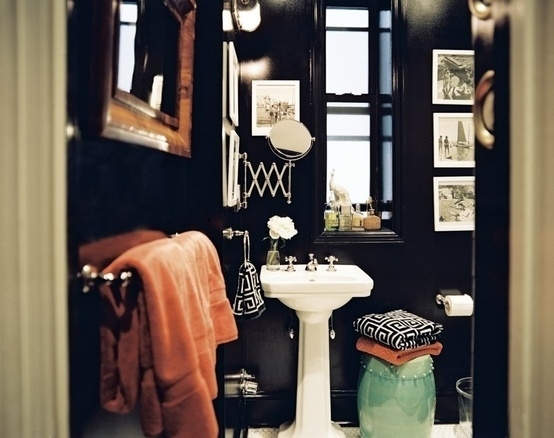 Another idea that you can spin off while keeping in mind a monochrome scheme is to have the entire bathroom decorated in only one color, and this is about the walls, the floor and the vanity altogether. 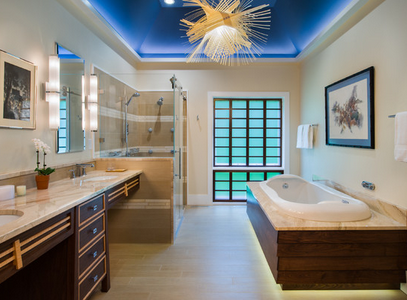 It can look really amazing if you choose a soothing pale color and light it up with the appropriate lighting. 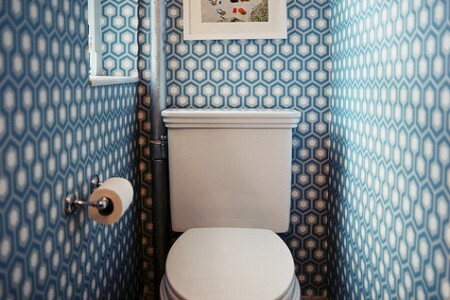 It may be a bit too much, but this bathroom is painted entirely in the same pattern. You could also use a similar pattern for the furniture and floor, and make the walls white. Then again, you can paint only one wall and have it match the floor. This is another one of those bathroom decor ideas that will cost next to nothing. 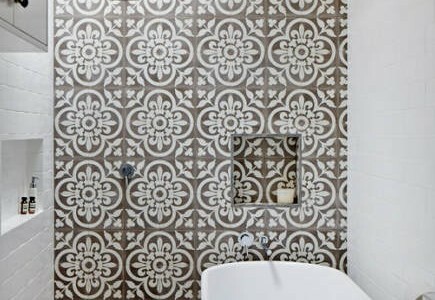 We are simply talking about adding patterns/textures to your wall and floor. 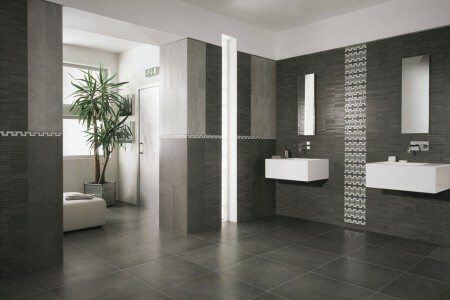 Granted, the tiles may be a bit expensive, but you should not spend more than 2000-3000$. Take a look around, check for tile prices, according to their quality, decide on your budget and we are sure you can make things work. Built-in shower door and neutral floor tiling. You probably think that a door is just a door. Its purpose is to keep a room open or closed and in most cases, it should keep everybody from seeing inside that specific room. However, bathroom doors can be used as interior decorations by themselves, and, if you are in luck, they can also help you gain a lot of space. Here is what all is about: pocket doors or barn doors aren’t something new in interior design, especially if the architect wants to save as much space as possible. If there is the chance of removing the classic door and replace it with a sliding one, the problem is solved. But let’s take a step further and think how would it be to have a pocket or a barn bathroom door made of a resistant translucent material that allows light to enter the bathroom to give it more space, doesn’t allow people to see inside the bathroom and become in and out of itself a statement of style? 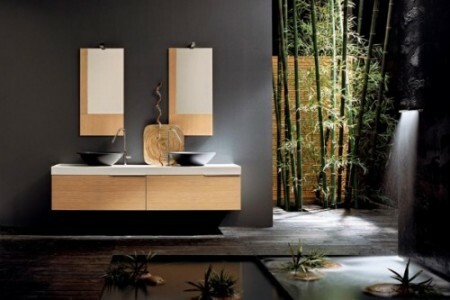 Sliding doors are not new to interior design and you will find many examples in Asian – inspired decoration suggestions, but think about your small bathroom deserving a dash of class. 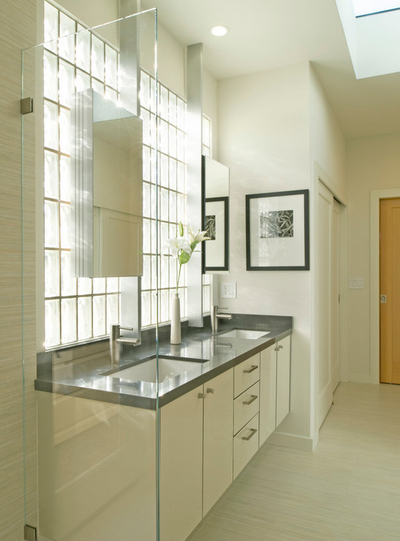 You can find on Houzz around 27,000 translucent door Bathroom Design Photos you can get inspired from. 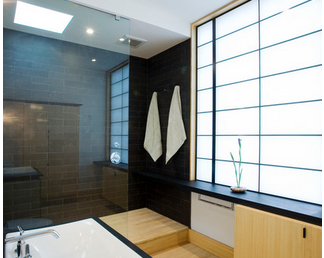 Playful shading systems that match the translucent glass doors of the bathroom. 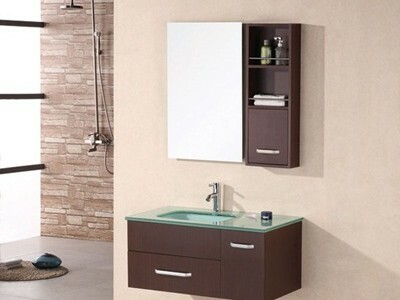 This might cost you more than you expect (over 2000$ if you are going for quality), because it is one of those decorating ideas for small bathrooms that requires customization. Since you are making this investment you should go for quality doors because they are subjected to a lot of “abuse”. Black walls with exotic plants for a spa-like look. 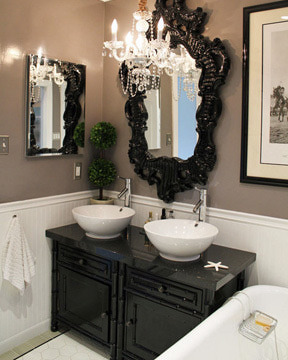 This is not a joke and you should trust the experts when they say that painting the walls in black and adding white contrasting bathroom objects and accessories (including mirror frames, towels and storage boxes) actually make the space look bigger instead of cramped. 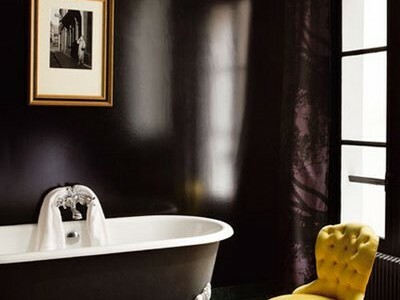 However, not many people would go for a dark environment and resent black as a decoration color or even support – color for contrast, while experts such as those from Lonny Magazine encourage us to forget everything we think we know about painting all black and give the dark side a chance. 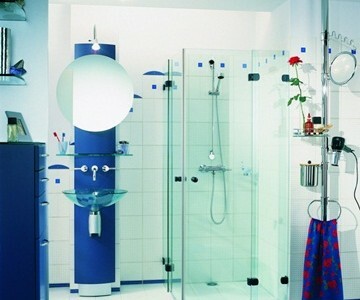 Royal Blue bathroom with translucent shower doors. We are talking about re-painting a room, how much could it cost? No more than 500$, most probably. You can even do this yourself and have a blast in the process. Dark colored walls and ceilings work well with any type of furniture. Just look at all the things you can store here. The problem with small bathrooms is that you never have enough space to move around, let alone deposit your beloved toiletries and accessories. Bathroom walls are difficult to redesign, as they usually host plumbing and pipes inside and sometimes are even tricky to redecorate due to unsymmetrical shape. 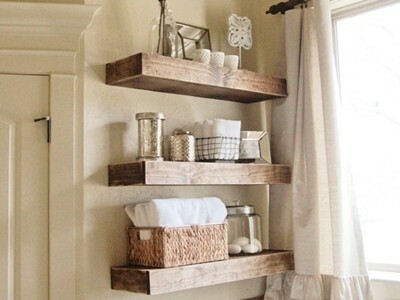 However, if you are lucky enough to have a wall that allows built – in shelves, there are a lot of bathroom decoration ideas that can be put into place with little effort. While some people cramp in everything they need for comfort, specialists however advise us against this method of storage and organization as it makes the little space you have look even more stuffed. Usually, white built-in shelves with fewer objects on them look the best but if you can’t approach the space problem otherwise but stuffing everything in them, choose colored boxes or rattan baskets to give the shelves a more ordered look. 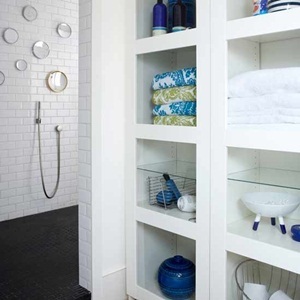 For more bathroom creative storage ideas, this article on Better Homes and Gardens may be a good starting point. This is less a problem of cost, and more a problem of space. It also depends on the structure of your house. You need non-structural walls in order to make this work, or you will have to make this work some other way. Also, taking down structural walls requires authorization. You should consult with your decorator/constructor on this one. Furniture plays an essential role in interior and exterior design and we can’t emphasize enough the importance of choosing the right furniture for the house, for the garden and even for your little cafe bar you’re considering opening up. 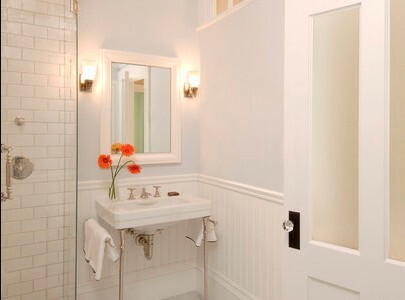 In decorating small bathrooms, designers use a lot of tricks, from choosing built – in vanities to offer discrete hidden storage room under the sink without abusing the space or using simple, yet elegant furniture to make perfect balance with the rest of the bathroom and to be put into value by the lighting choices. Crisp white bathroom walls contrasted by pastel colored furniture (or the other way around) and some light spots wisely placed to illuminate even the dark or shadowy corners might be a good solution if you don’t agree with the darkening of the whole place. 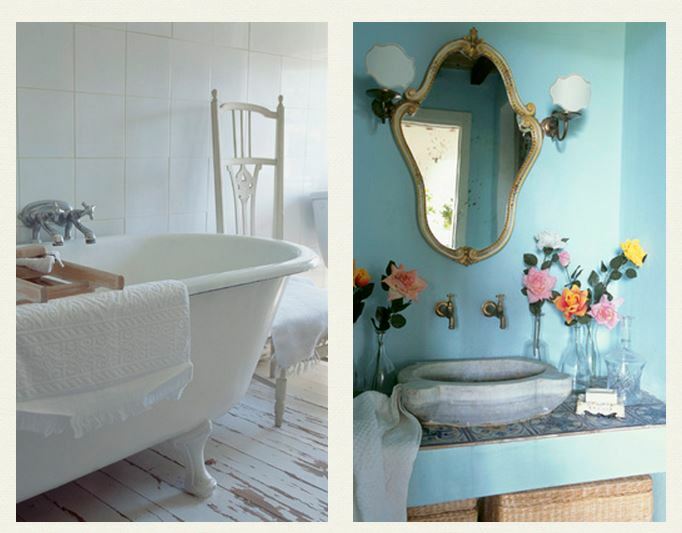 If you don’t find pastel furniture, the next best thing is to opt for a pastel joyful, colored bathroom, shabby-chic style, even with a dash of vintage, as fun and light colors will always make people feel better, more relaxed and more comfortable. 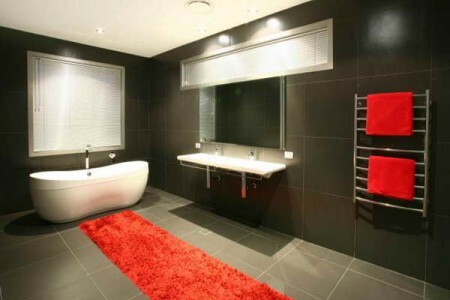 Here’s another example of small bathroom decorating ideas that should not cost very much. You can simply re-paint the walls in a warm color, and add some colorful decorations, but at the same time you can change the cabinets, tub, and counter-tops and pay more than 10.000$. It is up to you to decide the scale of your project. 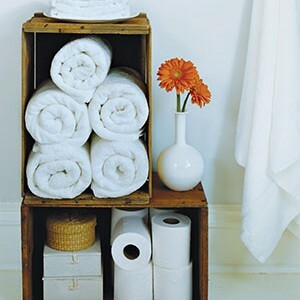 Crates that hold towels, bathroom supplies and a pretty flower. 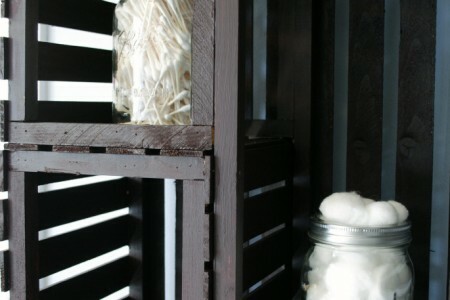 Not everybody can build shelves on their walls, while many still need some storage space. 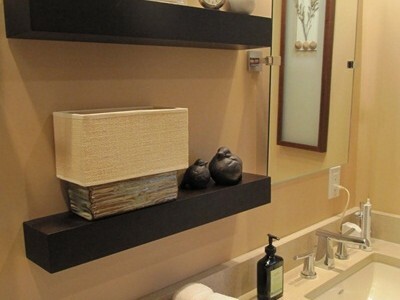 Sometimes, a space is so narrow, you might think that even a floating shelf is useless, while decorating the bathroom with cabinets or large structures is out of the question. But how about taking a step back and thinking things from a more rustic point of view? 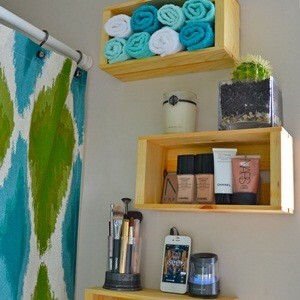 Wooden crates come in different sizes, are used, from obvious reasons, to meet storage purposes, so why wouldn’t make them very nice bathroom shelves, especially if you don’t have a big budget to spend on other bathroom decoration ideas? If you treat the crates to give them a vintage and rustic look, you can use them stocked or spread on the wall, according to the space available and needs. A nice wooden larger crate on the floor in a place where is absolutely necessary to keep some bathroom accessories may complete the design. This great article teaches you how to build and hang your own wood fruit crate shelves and from what it looks like, this might become your favorite DIY project in the future! This project costs exactly as much as the crates you use, and the tools used to make them look better. 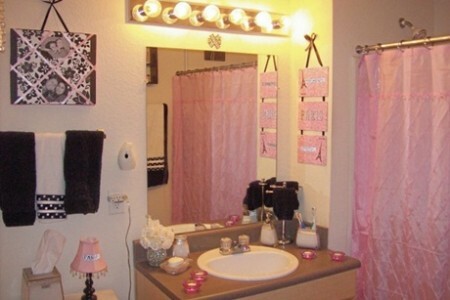 It is one of the most efficient DIY decorating ideas for small bathrooms. 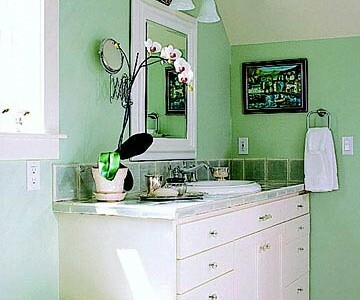 In addition to this, it is one of those half bathroom decorating ideas that cost close to nothing, and work superbly. 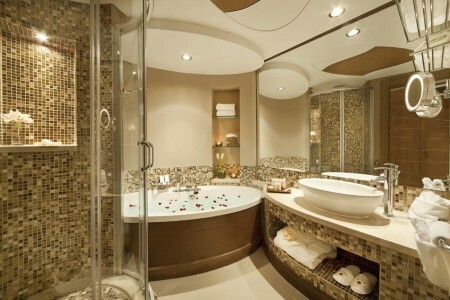 Spa-like bathroom with bath-tub in the floor. 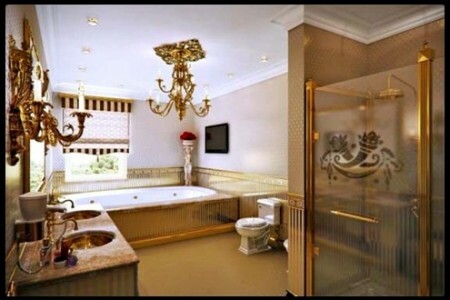 Large luxurious celebrities’ bathrooms, such as Nicholas Cage’s or Kirstie Alley’s go great with chandeliers, ornate large mirrors with a Versailles feel to them. Normally, a small bathroom would look crowded and even ridiculous with a large Renaissance mirror covering a wall (when everybody needs just a little more space) and sumptuous lighting, but if you have a little bit of taste and imagination, and this style fits your personal taste and vision, there are a few bathroom decorating ideas that you might want to explore more. 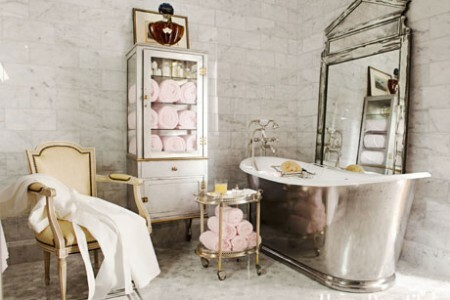 This bathroom was featured in Apartment Therapy and it proves once and for all that you can get a lavish bathroom even in a small designated place. 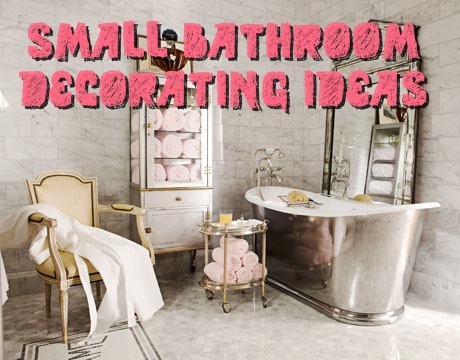 So what exactly do these small bathroom decorating ideas cost? A lot. We are talking about a serious investment. 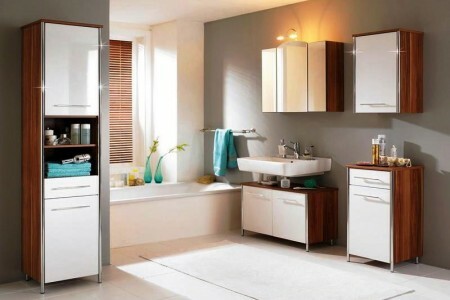 We are talking about full-scale remodeling which will take out everything you have, and replace it with something new. These projects hover around 30.000-100.000$. If you want to bathe like royalty, you have to pay like royalty. We’ve talked about storage ideas and making the best use of the available space. But what if the bathroom is really small? Designers say there’s no such thing as “too small” when it comes to finding the best solutions to make even the narrowest room look spacious and fun, and one way to do it is going all transparent. 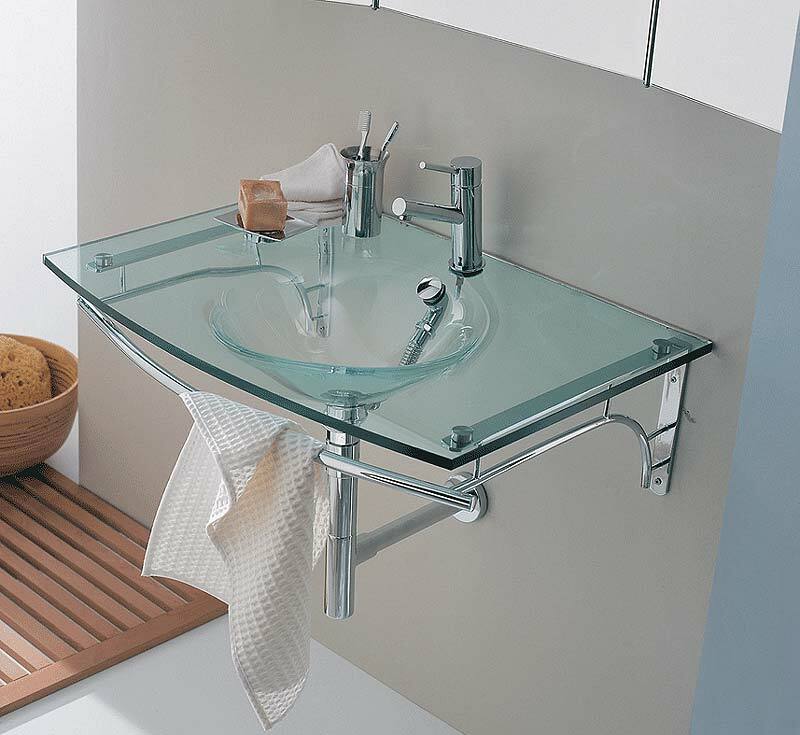 Of course, we are talking about a transparent glass vanity accompanied by a general neutral painting of the walls or light pastel floor tiles. The more you play with transparency and translucent decorations (now it would be a good idea to think about that translucent pocket door we already spoke of), the more spacious and comfortable your bathroom will look. 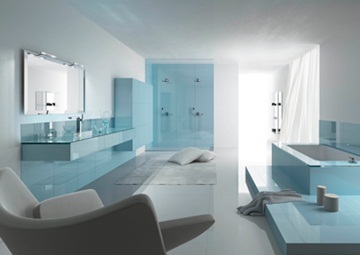 Transparent glass furniture and appliances are an investment, so if you are not ready for it, you should wait. There is no point in simply changing the appliances, if your counter-tops and cabinets don’t match. This is exactly the reason why these bathroom decor ideas fall in the mid-sized investment plans. This means that you will have to pay around 10.000-30.000$. A simple bathroom with Parisian decorations. 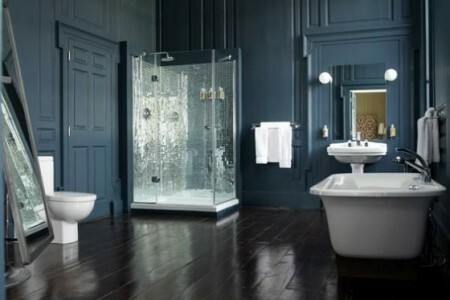 There is honestly nothing wrong with adding a bit of sophistication and style to your bathroom. It is not only the living room or the kitchen that deserves special treatment. 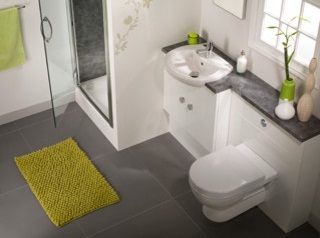 Did you know that the bathroom is the second most important room in the house, which greatly adds to its value? 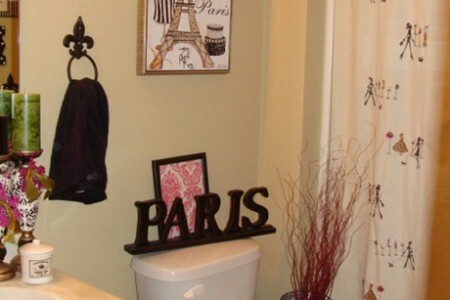 If you are willing to spend a bit more on bathroom decor ideas, here is an excellent idea: the Parisian Themed Bathroom. Uh la la! Patterns and Materials: You can basically use any patern or material you want in a Parisian bathroom, but it is advised to stick to stripes, polka dots and curving lines. As far as materials go, you should use natural ones like fabric shower curtains, and skirt sinks. 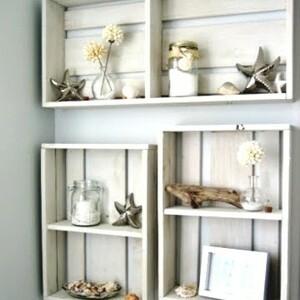 You should also think of wood for picture frames, sitting areas, free-standing cabinets etc. Colors: While it’s OK to play with patterns and materials, the color palette should remain limited. It is advised to use pink, black and white (or cream instead of white). Three colors is all you need to create depth and a warm, cozy feeling. Pink is not only a sign of femininity & sophistication but also of youth and exuberance. 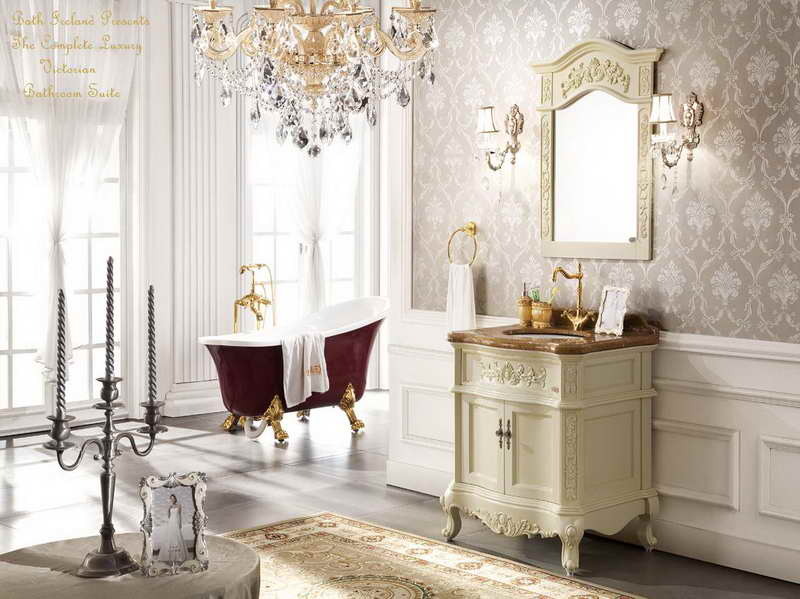 French Items: If you really want to go the extra-mile you should also purchase French items for your bathroom. This includes, but is not limited to vintage perfume bottles, French soaps and shampoos or souvenirs as decorative accents. All-white bathroom with creamy highlights and mini chandeliers. 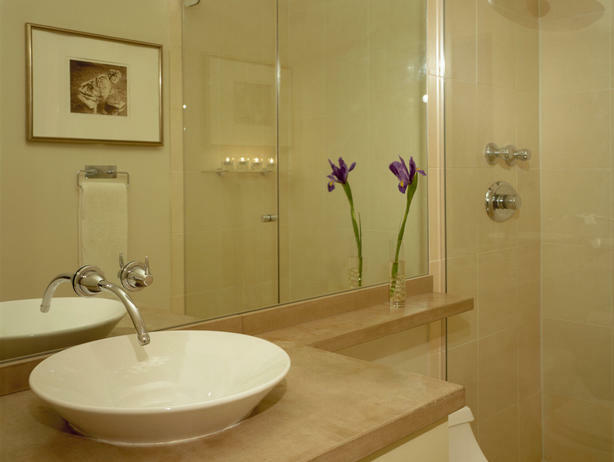 A complete Parisian Bathroom make-over usually falls into the mid to upper-range bathroom remodel. Why? 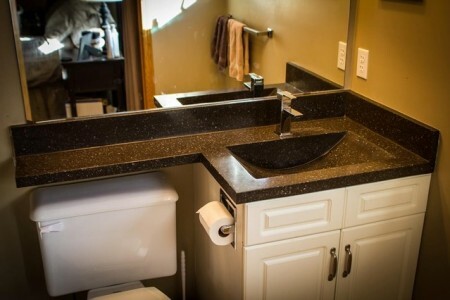 Because if you truly wish to obtain that sophisticated, totally new look you will also have to invest in new faucets, a better toilet, flooring, vanity, a new sink, lighting etc. Depending on the state in which you live this might cost somewhere between 10.000$ and 35.000$ max. There is also a possibility of handling some of the remodeling work yourself, and this will probably lower the cost with 10.000$ dollars. However, if you want to change the plumbing items (sink, toilet) you should prepare at least 20.000$. Yes, decorating bathroom ideas can be costly. 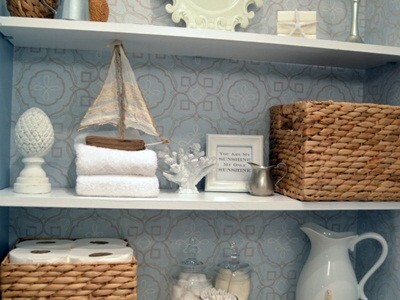 Kayla Kitts from HGTV gives us an amazingly simple decoration idea for small bathrooms in order to make use as much as we can of the available space and creating also some room to storage our accessories. The shelves are placed vertically on the wall, and you should know that the vertical trend is not only applicable to interior design, but to exterior too. Vertical gardens are also in the trends for those having little space to use. 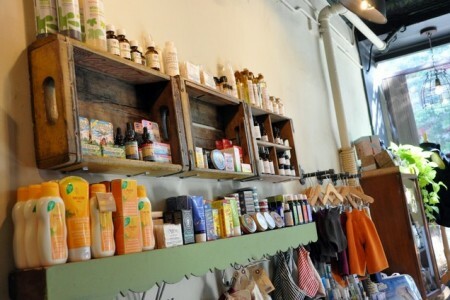 The floating shelves also allow the owner to push the space a little forward and install other types of storage options in the free space, such as baskets or boxes. 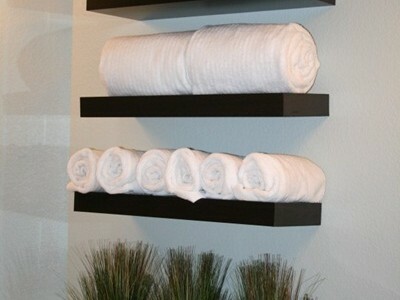 The floating shelves go great together with the wall above your toilet or the one next to your bath tub, for a spa feel and look. Of course, very small bathrooms rarely come with bath tubs and specialists consider even removing them and replacing them with shower cabinets but, if you really enjoy a bubble bath and you don’t want to give up on comfort for space, the floating shelves may bring in some great opportunities to have both practicality, style and pleasure in your small bathroom. 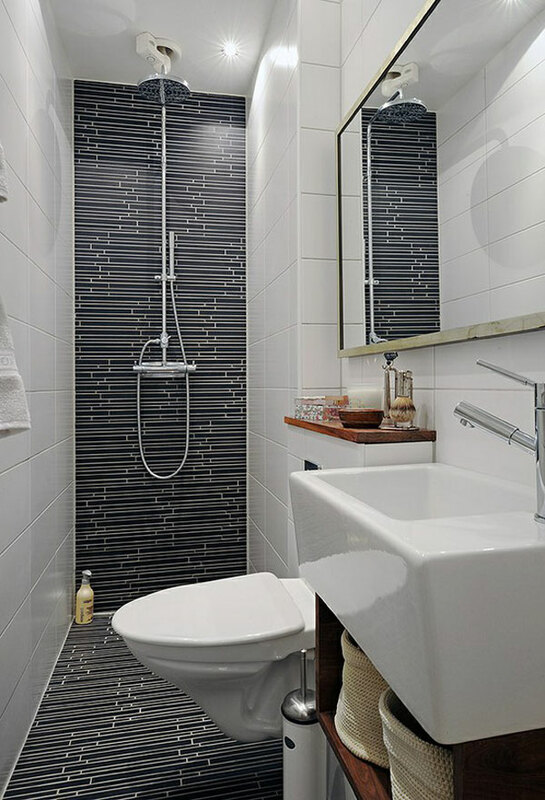 These apartment bathroom decorating ideas fall on the “cheap” side of remodels. Considering that you will only be mounting some shelves on the wall it can’t cost more than 1000$. The great thing about this idea is that you can do it yourself, and only spend money on the materials, which you can find at a flea market or garage sale. 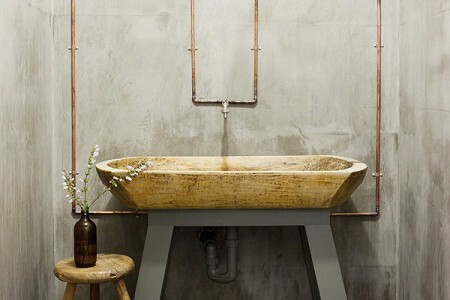 Number 15 on our bathroom decor ideas list is freeing up floor space. The biggest problem with small bathroom decorating ideas is finding space, because, well, small bathrooms are short on space. Most home-owners have no idea that adding many cupboards won’t help, and only make the room feel even smaller. 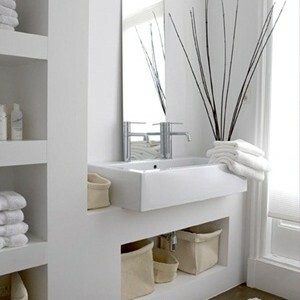 An innovative idea would be to use a wall-mount sink and floating shelves to free up floor space. 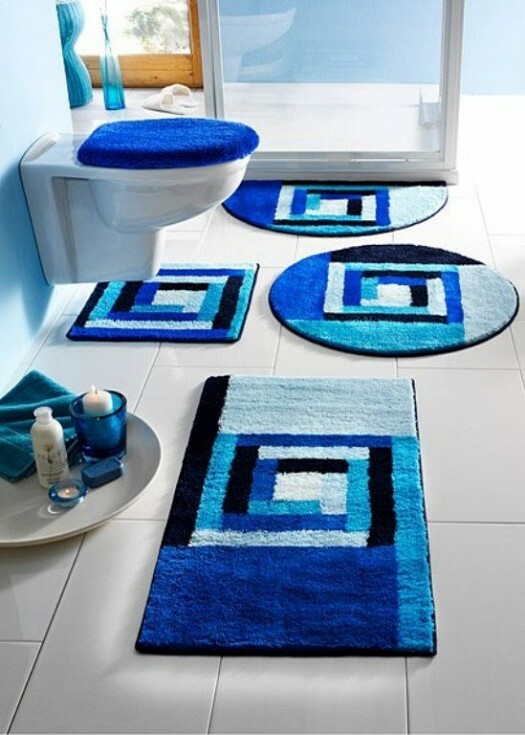 This will give your bathroom an unexpected look. You can free even more space by adding a bold texture on the floor, and light-colored walls or patterns. Additionally, you can put a great mirror on one of the walls to create a perfect perspective and add more depth to your bathroom. All of these fixes are extremely cheap, since they do not require a lot of changes to be made in the bathroom. So there you have it, this was our last example on the list of bathroom decorating ideas. As we already mentioned, it depends on the scale of the project. 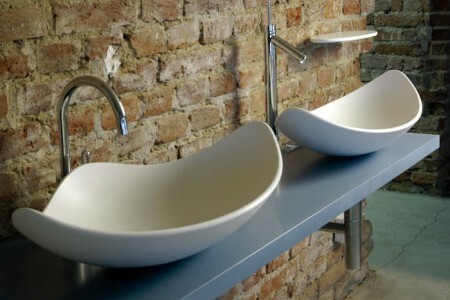 Wall-mounted sinks costs approximately the same as normal sinks, shelves can be made or purchased for reasonable prices, and repainting the walls isn’t expensive. The maximum cost should be approximately 3000-4000$. So that’s about it with our bathroom decor ideas girls and boys. What other decorating ideas for small bathrooms do you have? Ever had to design your own bathroom? What are your experiences with finding the style and managing the budget? Good … I agree with you, those ideas how you can decorate your small bathroom are very practical and elegant, but how expensive would it be? Unfortunately I do not think that everybody would allow it..
Lucky me, I have just started decorating the bathroom and I was looking for creative ideas to inspire me. Thank you for this topic. I would go for the last option with neutral and transparent, because I’m more a classy type. Thanks Andreea!